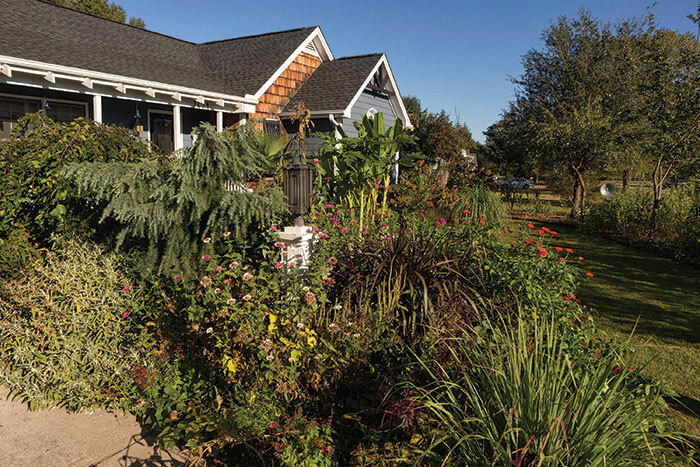 In her Fuquay-Varina yard, author Brie Arthur mixes vegetables, grains and other edibles with her ornamental plantings. The result looks so attractive it earned her Yard of the Month honors from her homeowners’ association. “They had no idea I was growing all this food,” she says. 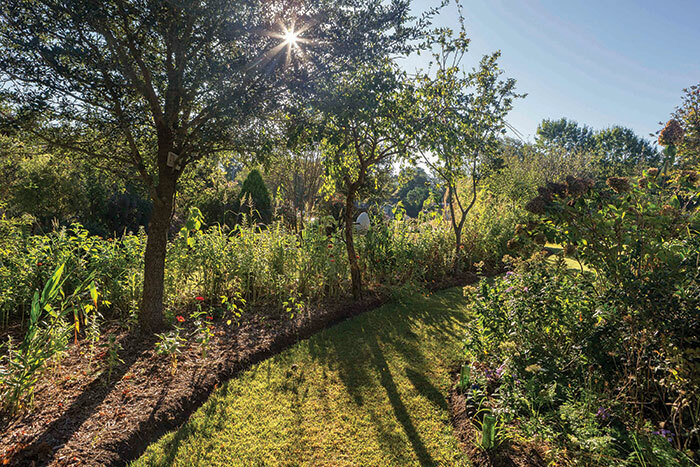 A morning stroll through Brie Arthur’s yard offers the grandest of garden tours, where corn grows alongside zinnias, peanuts peek from sun-warmed soil and a waving meadow of amber grains lures family photographers. Growing food and flowers requires lots of sun, and most of the time the sunniest spots in suburban yards are in the front. Arthur’s first crop was windowsill lettuce, blooming from 99 cents worth of seed as a budget-friendly supply of organic produce. Since then she’s incorporated annual crops into her suburban landscape for beauty and harvest. Each year, Arthur grows more than a hundred varieties of tomatoes, including the ‘Oh Happy Day’ hybrid. She tucks them next to hydrangeas or other shrubs, so the vines can twine up the branches. This eliminates the need for stakes or cages. Her first full foodscape in 2008 earned Yard of the Month honors from an unsuspecting homeowners’ association, something that still delights Arthur. 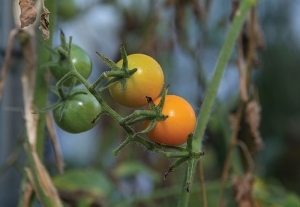 The first step to foodscaping, Arthur says, is to establish the framework of your ornamental garden — its trees and shrubs — before adding veggies. With favorite perennials and annuals tucked in, you won’t need to worry about mulch. Add food first at bed edges, even along sidewalks, planting sunny-spot edibles such as parsley and potatoes for easy watering and harvest. 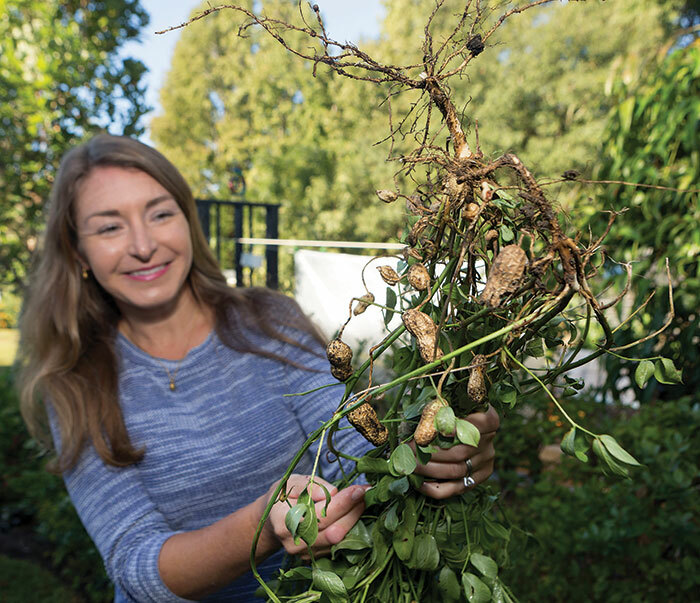 Peanuts, with their yellow flowers, are a drought-tolerant edger providing nutrients to the plants around them, and garlic along bed edges helps deter voles. 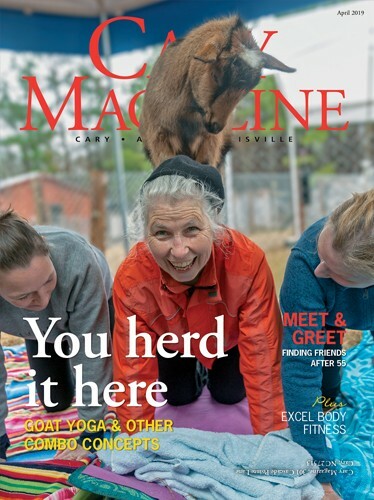 “The best advice I can offer is to grow what you love,” said Arthur, who simply steps outside to gather her favorite salad greens, peppers or sweet potatoes. Zone 1 → Closest to the house, grow a 50/50 split of ornamentals and everyday edibles like herbs, arugula and basil. Porch railings can offer plant support. Zone 2 → Mid-yard, grow a 60/40 ratio of pretties to foods, such as dwarf fruit trees, eggplant and oats. Arthur plants grain meadows here, which also serve as a privacy screen. Zone 3 → Farthest from the house, where irrigation access is reduced and plants are more exposed to roadside pollutants, aim for an 80/20 split of ornamentals and foods like carrots, soybeans and collards. In Arthur’s yard, ornamental grasses have given way to grains including corn, oats, sorghum and a wheat meadow that yields 15 pounds of flour annually. Arthur’s next book, “Gardening with Grains,” is coming in 2019. Edibles can even serve as groundcovers: Think oregano, squash, pumpkins, arugula, strawberries and kale. 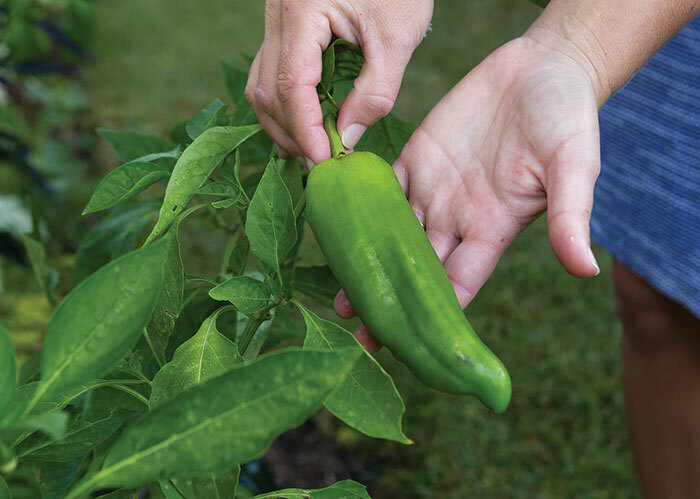 Swap small shrubs for basil, eggplant or peppers. The groceries grow alongside ornamentals like azaleas, roses, butterfly bushes and camellias, adding color and texture to the foodscape. Hydrangea and lilacs are “co-op” plants, supporting some edibles while sharing light, water and fertilizer requirements. A few pointers: Rabbits don’t like basil or rosemary, but they love soybeans, Arthur says. And a motion-detecting sprinkler system helps deter deer while irrigating your crops. In new neighborhoods, Arthur suggests planting edibles around young trees. Grains, okra, tomatillos, broccoli and peppers look like ornamental grasses, shrubs and flowers. She also uses wine bottles to edge her beds. Best of all, a yummy yard requires no more water than standard grass and little maintenance. 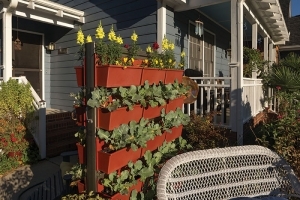 On a sunny patio, a vertical wall of greens, broccoli and kale can put fresh salad within steps of the back door. It also makes a useful and beautiful privacy screen. Not ready for a full foodscape? Making even a minor transition from grass to edibles in your yard offers big payoffs in healthy food, Arthur says. Foodscaping also reduces food miles and food deserts, and creates a more biodiverse habitat. You may even see a bumper crop of monarch butterflies. Arthur, the first recipient of the American Horticultural Society’s Emerging Horticultural Professional Award, in 2017, is working to mainstream the foodscape movement. 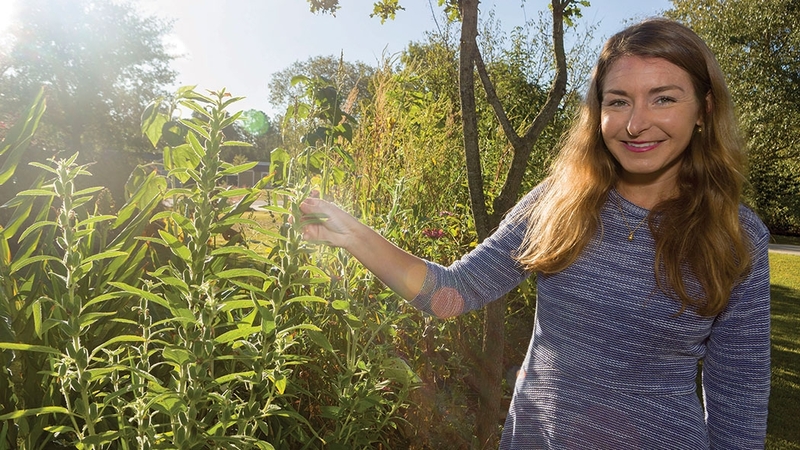 She is taking it to schools nationwide through her nonprofit, Brie Grows, which connects professional horticultural resources to school gardening curricula. Edging → Clean edges keep the HOA happy! Create yours with a heavy layer of mulch right at the lawn line, or by edging with stone, brick or wood. Evergreens → Shrubs and plants around the garden hold the structure even as veggies pass their peak. Edible options include rosemary, sweet bay laurel shrub, chives, sage, and creeping thyme and oregano. Upkeep → A 2-inch layer of mulch holds weeds at bay. For vining vegetables, use sturdy trellises or permanent structures that serve as focal points. She’s established a foodscape garden at Herbert Akins Road Elementary School in Fuquay-Varina, and led a school cafeteria in New Jersey to serve food grown in student-tended gardens. Arthur wants to integrate edibles into common spaces from subdivisions to office parks, and to see foodscaping offered as a service by landscape contractors. “We’re not pretending to be farmers,” Arthur said. “Being creative in your landscape should be something you do for pleasure. 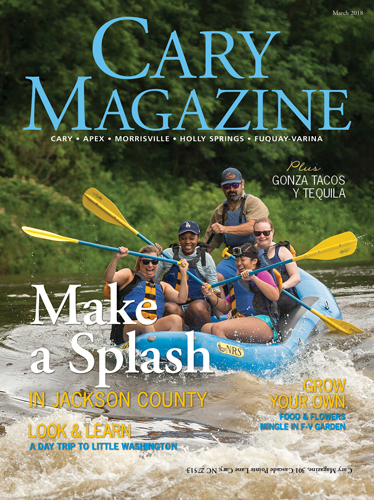 Garden on your own terms because you enjoy it as a hobby, a family-friendly activity that’s enriching for kids, where you can all learn together. Arthur plants peanuts at the edge of her beds. The drought-tolerant legume has attractive yellow flowers, and it returns nutrients to the soil. Spanish peppers have attractive foliage, and when ripe, the peppers will turn bright orange.